Balsamic ointment, can be massaged on the chest, under the nostrils or on foot soles, to prevent cases of congestion, thanks to the blend of balsamic essential oils: Eucalyptus, Menthol, Thyme, Lavender and Cloves. 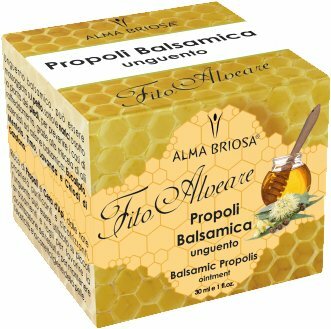 Rich in Propolis and Beeswax, purifying and healing, the ointment can be used on small rashes and cuts to promote tissue healing, and to maintain elasticity and proper skin hygiene. Natural Functional Principles	 Honey and Propolis with Eucalyptus, Thyme, Menthol, Clove, Lavender, Argan oil, Beeswax, Shea Butter, and Sweet Almond oil. INGREDIENTI/INGREDIENTS: Butyrospermum parkii butter**, Prunus amygdalus dulcis oil**, Menthol**, Cera alba**, Eucalyptus globulus leaf oil**, Eugenol**, Mel**, Glycerin**, Propolis extract**, Argania spinosa oil*/**, Thymus vulgaris oil**, Eugenia caryophyllus oil**, Lavandula angustifolia oil**, Limonene**, Linalool**, Aqua**.